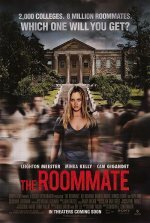 The Roommate Movie updates 2,000 Colleges. 8 Million Roommates. Which One Will You Get? added the tagline: "2,000 Colleges. 8 Million Roommates. Which One Will You Get?"